Meanwhile in Japan, Nintendo continues its invasion of the mobile phone market with Pokémon Co-Master. Pokémon Co-Master is basically a digital version of 2006's Pokémon Trading Figure Game. 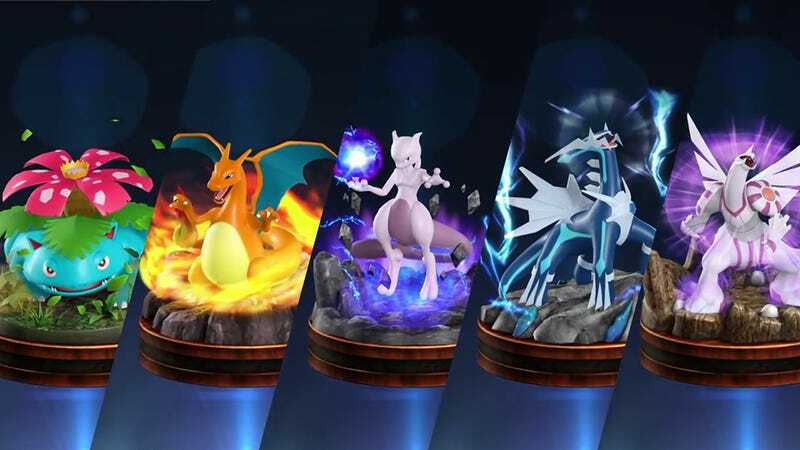 To start, you and your opponent each pick six Pokémon figures. You then alternate placing these figures on the board at their respective corners or moving figures already placed on the board. The goal is to have one of your Pokémon make it to your enemy’s base, capturing it and winning the game. The board itself isn’t very large. In fact, the opposing bases are only ten spaces apart even if you take the longest route. The figures themselves have different movement speeds depending on the Pokémon, but most can move two or three spaces per turn. Of course, your enemy won’t simply let you win, so you’ll need to defeat the Pokémon figures he or she puts in your way. This can be done in one of two ways. The first is to surround your rival’s figure and leave it with no possible moves, which results in an instant kill. But the far more common way to defeat an opposing Pokémon is through battle. Each Pokémon figure has a spin-able dial that looks like a pie chart. The parts of the pie chart correspond to the different attacks (or other special moves) which that Pokémon can do. Each of these attacks does a different amount of damage and takes up a different proportion of the pie chart. Of course, there is always a portion of each dial designated to that Pokémon missing its attack entirely. To battle, two neighboring figures on the board are pressed together. Then the dials are spun. Whichever actions are touching when the spinning pie charts come to rest are the actions the respective Pokémon perform. Or to put it more simply, whichever dial stops on the higher number wins. The loser Pokémon is instantly defeated and taken off the board. This randomness in battle is the biggest turn off of the game for me. There is very little skill needed for Pokémon Co-Master. The moves in nearly every situation are obvious after just a few hours of play, and even if they’re not in your case, there is an AI to assist you any time you want. But no matter how well you move your pieces, it’s all up to your spin of a wheel, and your opponent’s spin of his or her own. You can use temporary attack boosting cards, sure, but some rounds, it seems the RNG gods have simply decided you will lose before you even start playing. Of course, if you find yourself losing again and again, there is one surefire way to win more, by getting new Pokémon with better attack dials. The easiest way to do this is through the paid gatcha where you can turn your hard earned real world cash into the possibility of a better Pokémon than the ones you have already. There are other ways of getting new Pokémon that don’t require a cash investment, however, like the gems you get as a daily login bonus. Each battle in the game’s story mode (kid comes to city and enters a tourney to be the best figure battler ever) has different optional objectives. Completing these nets you new Pokémon or other rewards. There is also a reward each time you beat an opponent. The rare reward is usually one of the Pokémon that trainer was using. At this point, I’m only a few hours into Pokémon Co-Master and I am already living in a place between frustrated and bored. When I win, it’s because either my Pokémon dials were better overall or my luck was simply better. Skill never factors in. Perhaps if I had the drive to get my favorite Pokémon—or the ambition to catch ‘em all—I’d be more invested. But as it stands now, every time I am defeated by a bad spin, I question why I am even playing. Pokémon Co-Master was released on iOS and Android in Japan on April 19, 2016, and April 12, 2016, respectively.